We finally caught our first VIP bus. It was like travelling business class on an aeroplane; cushy leather seats, long wide footrests and a full recline of the chair. It was heaven compared to the other ‘cattle class’ buses which covered the same 500-1000 kilometre trips. We were even provided little pre-packed meals an hour into the journey. In Esfahan we stayed in a hostel with lots of other tourists. It was the first time we’d really spent any time around tourists which was quite refreshing although the stories of intrepid travel through Iran (which were always bigger than Ben Hur) got old pretty quickly. We got to know a bunch of seven Slovakian para-gliders who were under a type of house arrest at the hostel for flying and landing in or near military land. Three of their friends were in jail in Esfahan. They claim they didn’t know that they were near military zones. It just goes to show the heavy-handed nature of the police if there is an inkling of a reason (we never had an altercation with an officer). On our second night we were walking along heading nose-wards towards dinner when a voice from behind asked, “where are you from?”. We explained our situation and he politely asked if he could ask us another question. “Why do you walk so fast?”. We had no reason. Mustafa was going for a late night walk after studying all day. We invited him to eat some food with us, and walked down to Khaju bridge (an absolutely incredible piece of work) where we got given a private tour by more leaders than just Mustafa; a Esfahani history teacher also wanted to give us a lesson. The thing that most blew our mind were two marble lion statues on either side of the river which had eyes that illuminated when you looked at them from in front of a lion on the opposite side of the river. There were no lights inside the statues’ eyes, just some clever light manipulation. The mountain was an incredible buzz of life before 6am. Literally thousands of other Esfahanis were doing the same as us. During the summer months, Mustafa’s parents (Ali and Zahra) do the 500m vertical climb three or more times a week to a picnic spot that they have been visiting all of their lives. Their friends also share the same picnic spot and meet up the top once a week to sing, dance and eat. Mt Sofeh has claimed the lives of many people, including four so far in 2013. Despite this, Iranians scramble up the loose, steep rock situated over nice cliff drops. There are no signs of caution, no barriers, no marked trails and with Iranians wearing their typically inappropriate footwear – it’s just a mountain of disasters waiting to happen. Needless to say, we treaded carefully. In the car on the way home, we realised our wallet was not in our bag. It must’ve fallen out somewhere on the mountain. Almost immediately, we wrote it off and expected never to see it again. Mustafa and his family were distraught; they had to get it back for us. They offered to climb the mountain again in search of it, but we had to make them promise not to do this; it could’ve been anywhere we’d walked in the last three hours! A day went by and at 11:30pm the next night we heard a knock at our door. It was Mustafa with the news our wallet had been found! We got in the car with the whole family and met a friend of the family, Hussein, who vaguely knew someone who knew the person who had our wallet. We picked up “Wally” from Mansur who was ever so excited to give it back to us with nothing out of place. He even invited us for tea at his house! Hussein then brought us to his house for chai and Hafez poem readings. Alex’s was remarkably accurate but Kat’s was wildly irrelevant. We were driven home at 2:30am and organised to meet up again with Mustafa’s family the next night for home-cooked vegetarian delights. Nothing specific was arranged at the time and we asked Mustafa to let us know what time was good via email. The next day went past but no email had arrived, it was getting late but we knew that Iranians often eat late. Then it was 11pm, so we called to see if everything was alright. It turned out that Mustafa and his family had waited for one hour outside our hostel between 7-8pm, although we weren’t aware of this meeting time – they thought we bailed on them! The strange thing was that they never came inside to ask for us at reception like they had done a mere 24 hours prior during the missing wallet saga. Damn you miscommunication! At the bus station we happened upon an Aussie woman named Marika and her French partner named Guillaume and proceeded to make the stuffy but eclectically decorated journey to Khoor together. After arriving we discovered fellow journeymen (and women) Alice from France and her well-travelled, well-impassioned Iranian housemates Delaram and Yazdan. 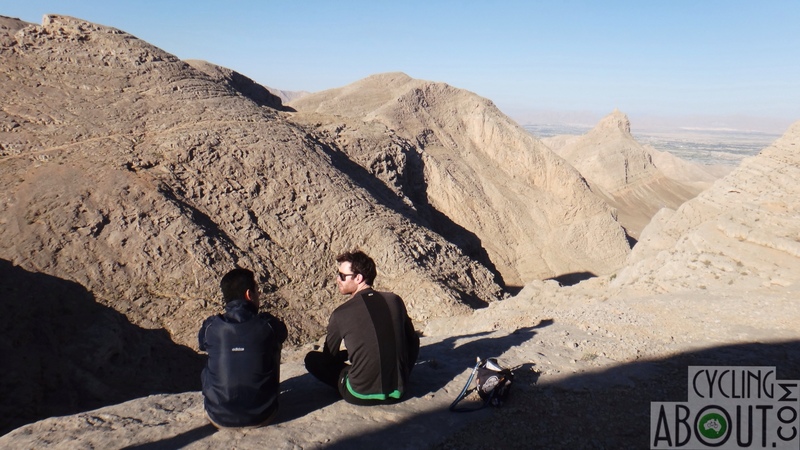 We travelled together to a small desert oasis village named ‘Garmeh’ – meaning ‘hot’ in farsi. And that it was! 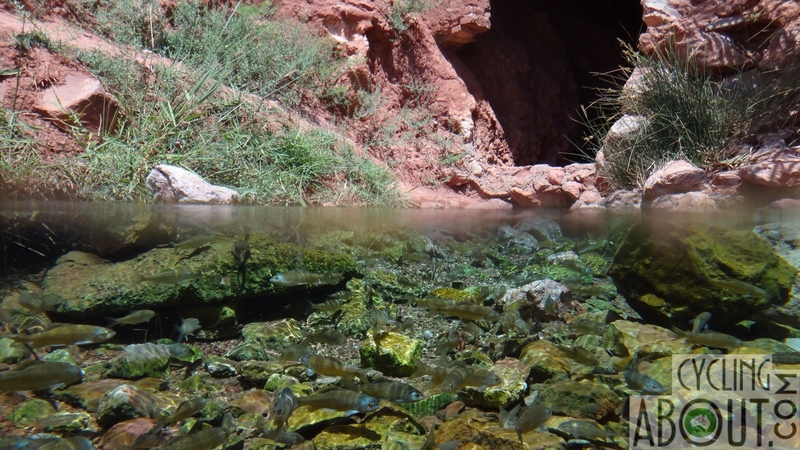 It became apparent that Garmeh was nothing without Ateshoni. The place was super expensive by Iranian standards and the food, basic. We had heard that Ateshoni spends lots of time with you, teaching you music and showing you the region and his heart – which makes the price worth it. Without this expected experience, the eight of us felt somewhat ripped-off as we were left to our own devices. What was cool was having the dead skin eaten from our feet in a local fish pond! We also went on a half day tour with Arne the Dutch traveller and George, an older Swiss gentleman in a taxi van that tried to break down on a number of occasions, on a day of 50 degrees or more. We visited a salt river and a salt lake (both technically man-made but in different ways), took awesome photos of dung beetles and each other and made our way out to wait for a loooong time to see if a camel herder could locate his camels. He did so after dusk, so some of our members climbed astride the dromedary (not barterial??) camels, others chose to marvel at the smelly, emphatically grand wool-shedding camel families left in the sand and driftwood pen. We made it to Yazd with our friends Marika and Guillaume by bus (Arne and George joined us later) and accidentally ran into a local after simply asking for a direction to a hotel. From then on Ali accompanied us whether we liked it or not – hovering about like a lovelorn fly, despite our foursome wanting some privacy and noting this as ‘we are going to be really boring today’. Ali wanted to interact with us and drive us everywhere, so to some extent we let him. We were given the gift (although nothing in life is free) of privacy by agreeing to let him show us some sights the next day. Yazd is an incredible city, perhaps the most impressive in Iran. The sandy buildings, monuments, mosques, wind catchers, tight streets and bazaar make it very special. The Silk Road Hotel was cheap with a raft of phenomenal food and freshly made juice (no sugar added on request!) Kat spent time with a secondary school friend, Amelia who just happened to be in the same hotel, on the other side of the world from home. It’s amazing that things like this happen, but we so enjoy them when they do. We went around with Ali and were taken on a wild ride – with no real idea of what was happening. We were taken an hour out of Yazd to friends of Ali’s holiday house. A swimming pool was filled on our behalf but it was beyond filthy! The boys were all super nice, bringing us chai, but making us feel a little weird by not joining us in drinking it. Volleyball and sand dune running was on the agenda before we made it home via a restaurant so that Ali could, we think, show us off. We were already a bit perturbed but he was insistent and didn’t seem insidious. We left Arne, Guillaume and Marika and headed back to Tehran. With Ali. Don’t ask us why – he claimed his family were demanding to see him and would be lonely on the seven hour drive there, and so against our better judgement we accompanied him. This was where some of his lies began to unravel. His lovely girlfriend Mahnuz joined us, totally fine, she was gorgeous and spoke a little English, all fine and dandy, but weren’t we there as company to Ali because he’d be lonely? We stopped a couple of times to be shown to Ali’s friends (in Yazd, Qom and Tehran). The journey ended up taking ten hours from start to finish because the various visits we made. We were supposed to meet his mother, father and sister for dinner in Tehran, but at the very last minute they apparently had to go to a funeral in Esfahan. Instead we met Jila, Ali’s very well spoken charming cousin and learned some of the things Ali had told us weren’t true – just random, unimportant things like where he was born and where he’d spent his life, how old he was and what he did for work… all ridiculous stuff to lie about, but the web was wide and weird. We decided we should cut ties but couldn’t do it – we felt like we’d used him but at the same time that he’d used us. It was hard (and mostly out fault too). We accepted his invitation to meet up later in the week when we weren’t so terribly busy – we needed to get 100 things done (like receive our new wheel, get it built, and meet up with a collection of lovely people who we’d promised more of our time (who hadn’t woven a woollen blanket of lies to swaddle our attention and affection)). We ended up back at our friend Mohammad’s house (where we received frantic emails from Ali demanding satisfaction as he’d called our hotel and we weren’t there… despite us only informing him we’d be there for one night) and breathed out and in the wonderful companionship of our adoptive Iranian family. Our brother Sina, our sister Soha, our mother Fariba and of course our father and friend Mohammed. They showed us more of Tehran and their generosity, we felt more relaxed than we had done in weeks. 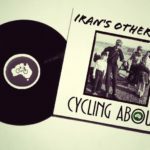 We found out that with only a few days left in Tehran, that our wheel was still in England despite the tracking confirming that it had been delivered! We only had a few days before we had to be in Turkmenistan, so it was going to be a stressful few nights. We met up with Ali and Jila again – he took us all to Mahnuz’s family farm, ripe with fruit trees and flowers and a generous family who wanted us to stay for dinner. We were then chaperoned to Ali’s cousin’s place to meet her new baby and some more of his extended family, and then to a house in Karaj (30km out of Tehran) that he shares with this cousin (one of the collection of houses he owns?! Who is this person?!) where he was disappointed we didn’t want to stay any longer than one night. He had, in-hand, our information about us needing to do lots of things in Tehran but chose to fist up that information and throw it away. It was an extremely strange experience where we tried to enjoy the company and events but felt constantly in Ali’s debt somehow; our whithers were bristling, indicating something slightly awry. With that strange happening behind us (mostly, apart from the occasional demanding email enquiry from Ali) we sorted out our wheel debacle in the eleventh hour, went to play badminton in the park at 12:30am with Sina who made it so enjoyable it may as well have been a completely normal and natural thing to do, Alex climbed a mountain behind Tehran with Mohammed at dawn and we had to say a sad goodbye to our favourite family. Our last days (without any free time really) were filled with acquaintances new and old (and our movements were slightly marred by our suspicion that Ali could track every move!). We made firm friends with Arman from Cafe Romance (the best and most hipster-approved cafe in Tehran), we caught up again with our dietician friend Reza from Talesh and our old and wonderful Persian prince of the Turkish farm we worked at, Mahna! Unfortunately we were poised to leave and couldn’t spend more than a few hours with our pals, but they’ll be in our future we’re sure. We departed from South Tehran bus terminal with the usual flamboyant ruckus TanNayNay brings; at the last minute the arrogant bus driver decided he wouldn’t take a bike in the bus (although he was storing not one but two motor bikes in the luggage compartments) but as is typical of Persians, we were saved when a group of three English-speaking gentlemen took pity on us and helped us negotiate a bus swap with only a very small fee and only an hour longer wait. There’s nothing quite like Iranian hospitality, no matter where you are. The bus was VIP and we lounged our way (with TanNayNay safely tucked up below us) to Mashhad. Vali’s Guesthouse was full (and Vali seemed a little sour for our taste) but his mate Rafi, after trying to negotiate prices and destinations with us, soon read Alleykat for what we are: poor-ish bike travellers looking to meet people rather than hide away in a hotel. So, soon we were following his friend Javad to his small, lavishly decorated apartment to meet Javad’s artist wife Vahideh and their truly delightful daughter Parisa (who shared with Kat a love of Johnny Depp among other important life values). 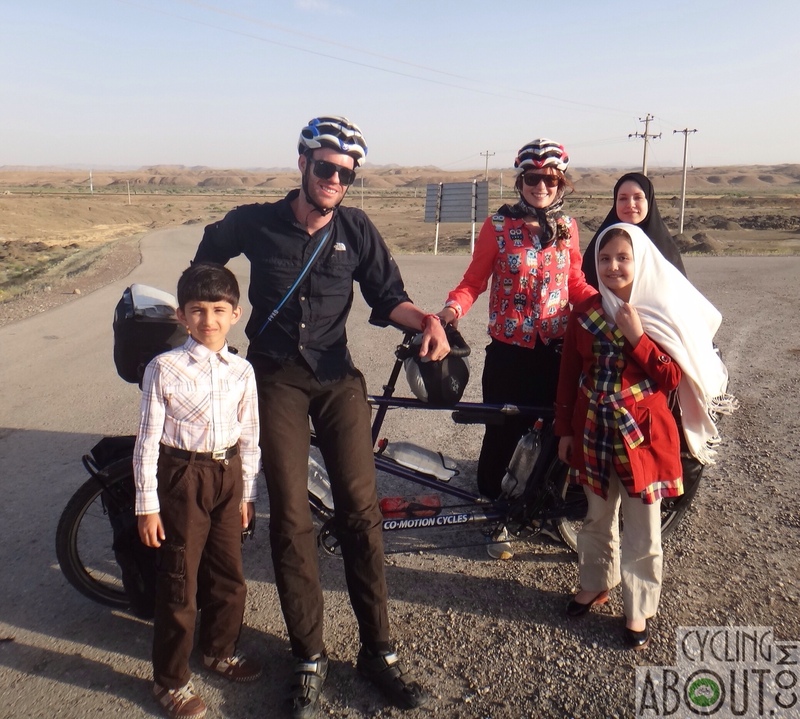 We had a great night with this super generous family, sadly staying only one night as our visa for Turkmenistan was almost upon us and so we left at 7:30am, blissful to be back on the bike. Our first day took us 120 kilometres along the road. During the heat of the day, the relentless temperature soared like a bird of prey, forcing us off this well-paved stretch and into disused drains where we hid. We even felt a wonderful cross-breeze as we snoozed until the late afternoon to escape the oppressive hunter, summer. We were stopped by a man who highly, forcefully recommended staying at the Mosque just before the hill but when we reached its double pillared presence, there wasn’t a suitable place to turn the boat and so we kept on paddling. Nearing the crest and darkness we were met again by this man, he was more than a bit miffed that we’d not followed his directions, however, he bid us good luck. Evening took us up, up and over the hill where our camping spot was perfectly hidden just a small scramble down a ridge. A beautiful blue kingfisher-like bird watched over us the next morning (we’d been accompanied by his family since about 13 kilometres out of Mashhad). 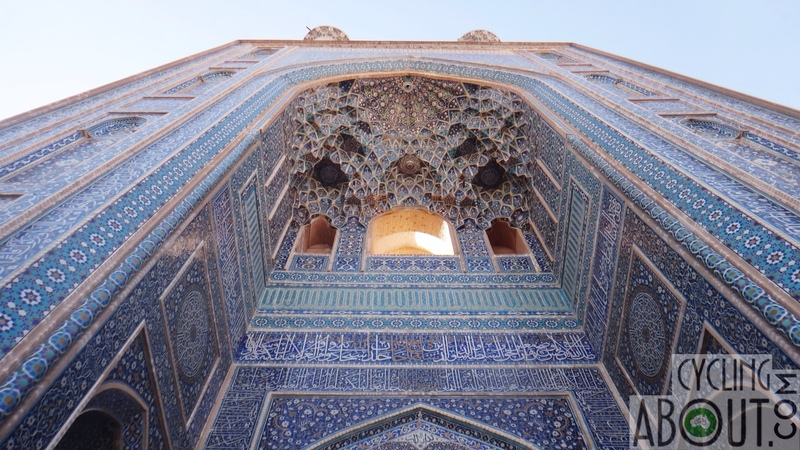 This day was also blisteringly hot with a fierce head wind; but thanks to a 6am start we rolled into Sarakhs and holed up in the Red Crescent – where we made base in the female section of the prayer room, as y’do. 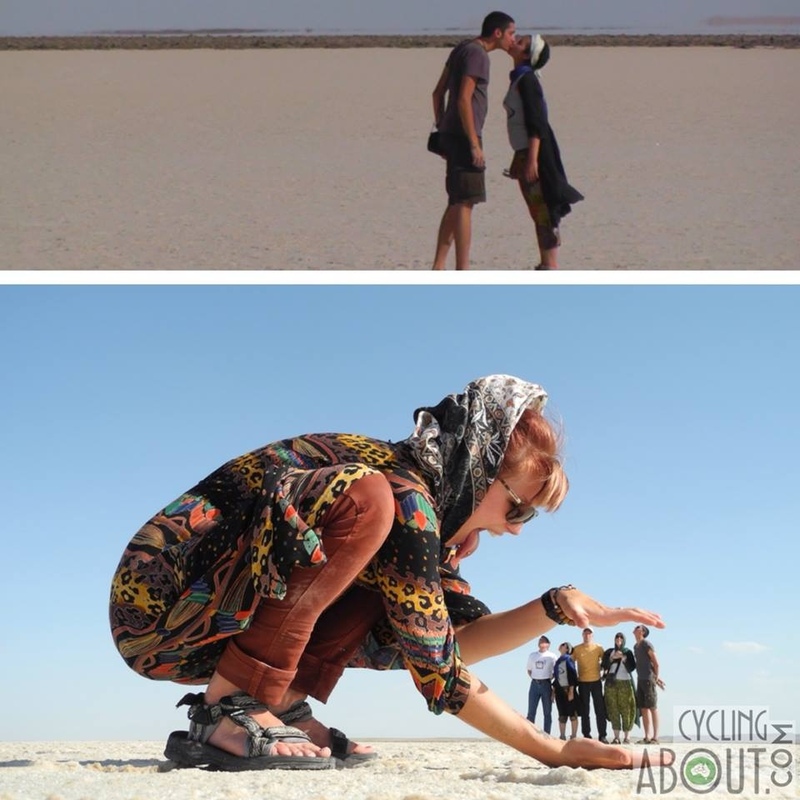 Kat felt poorly and Alex agreed to be interviewed for a TV station, so joined the Swiss couple also on a tandem to tell Iranian viewers all about bike riding and travel. All three interviewees feigned ignorance when pelted with questions about the political elections coming up the day after we were to cross the border, luckily ignorance is bliss – real or false. 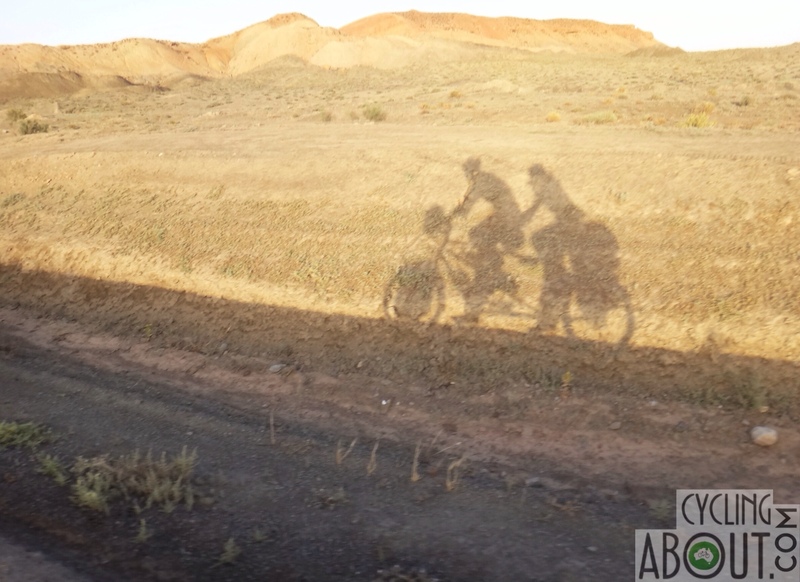 The tandem couple, Marcel and Alena were divine, we ate dinner with them and thanked the bike gods for forcing us to synchronise our Turkmenistan visas for the 13th to the 17th. Bang on perfect timing.